Polar Bookshelf is a free software to manage eBooks, offline web pages with annotation and reading progress. Here it lets you manage a book library on your PC easily. And you can add web pages in your archive as well for offline reading. For saving webpages, it lets you capture them via their URL. You can save all the notes, books that you download in this software and find them when you need them. It offers you an intuitive viewer in which you can open the saved eBooks and captured web pages. And you can annotate the content in your books or web pages and save the reading progress. 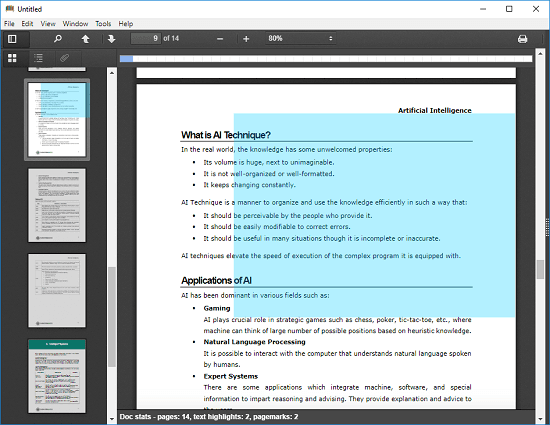 This is a cross-platform software that allows you to manage your notes, ebooks, research papers, and other reading stuff and in one place. It lets you categorize the different content in your store via tags. And there is a search box as well that you can use to quickly find anything that you want. There is a pagemarking feature in this that you can use to save the reading progress on an ebook. And you can highlight text using a marker and list all the annotations from the current document. 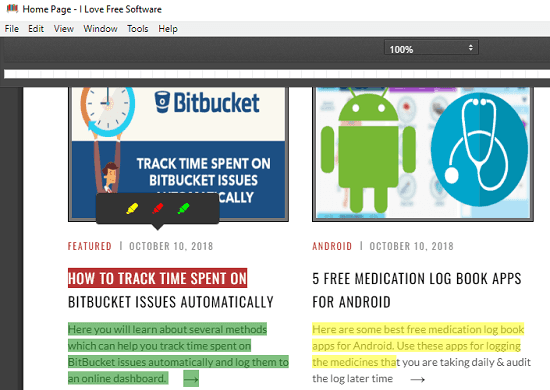 How to Manage eBooks, Offline Webpages, with Annotation and Reading Progress? Polar Bookshelf is an open source software that lets you manage your reading stuff. Unlike document management software, it not just saves all your data but allows you to read them as well. And the annotation part is amazing to make your reading easy and less forgetful. With the help of “Pagemarks” you will never lose the reading progress of any book. And you can add different colored page markers to the books and find them later easily. Simply download this software from here and then install it. Next open it and then start adding your content in it. It doesn’t automatically locate the PDFs on your PC. You will have to explicitly add them in it. 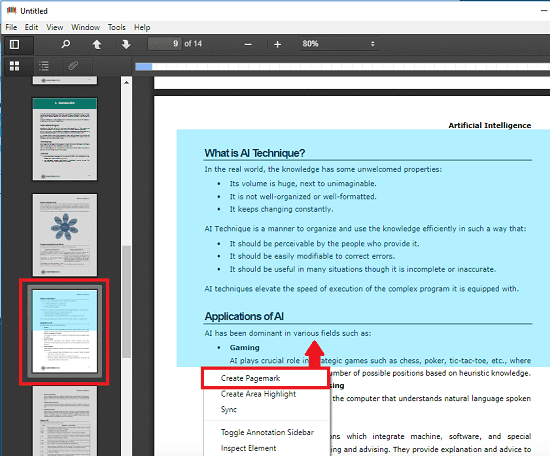 Use the File > Open menu to import a PDF file or a PDF eBook in it. 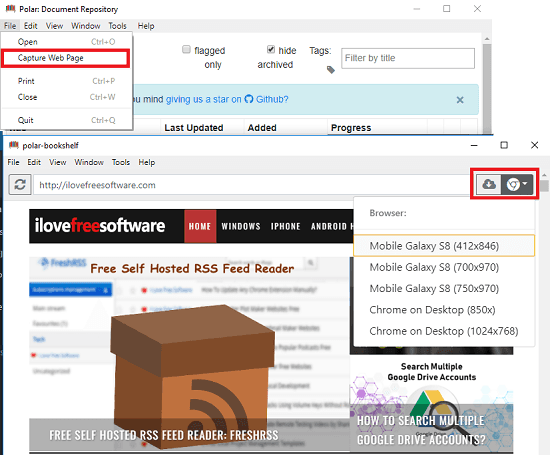 To capture a webpage and save in this software, use the File > Capture Web Page option. After that, enter a URL in the browser that you want to save in it. For capturing a web page, you can use different user agents as well like mobile, tablet, desktop, etc. After adding the eBooks and web pages, you can start reading them. And it will open them for you in a separate viewer window which is interactive. You can read the content that you have saved and annotate it if you want to. For highlighting text, select some text in the current document and then select a marker color to highlight that. To keep track of the reading progress, you can leave a Pagemark on the current page. To add a pagemark, simply right-click on a page and then select “Create Pagemark” option. It will add a blue transparent colored cover on the page which is visible in the thumbnails as well. You can leave the pagemark on the current page and you can even resize it. Next time, you open a book, you can easily find the last page you were reading by just looking at the thumbnails. Also, the progress on a eBook can be seen from the main interface. In this way, you can use this free software, Polar Bookshelf to manage eBooks, offline webpages. And you can do that pretty easily. Just keep adding your content in it and then manage them like a pro. To categorize the content in the software, you can add tags to the different books and web pages from the main interface. Polar Bookshelf is a free, nice software for you if you are a regular eBook reader. With this, you can easily manage your notes, books, and other reading stuff in an efficient manner. And what I really liked about it is the annotation and progress saving part. 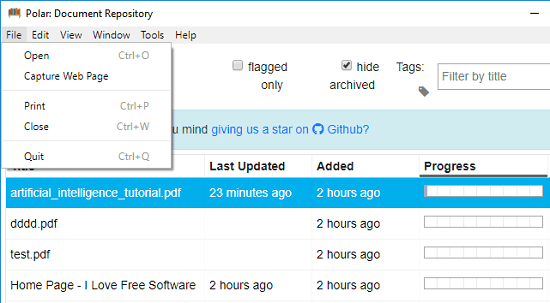 You can easily store unlimited stuff in it and manage that using the different tools that it offers.